Here are five easy summer arrangements to inspire you to be able to enjoy the fruits of your garden labor. All plants benefit from pruning and dead-heading so cutting a few blooms it a great way to bring the outside in. This is good when you don’t have a lot of flowers. Also for the delicate beauties that get lost in the crowd of bigger show offs. You can use a mix of clear jars and vases as I have here. Mason jars and milk bottles work great too. Dollare store vase, even old jelly jars work well here. This arrangement allows a fancy vase to shine as well as the flowers. Here I used Hydrangea Paniculata ‘Limelight’. This works well for those who enjoy modern elements in their decor. My Oakleaf Hydrangea is spilling into the sidewalk so I cut it back. The large pink blooms fit nicely it this basket. I added a few sprigs of Ninebark Diablo for contrast. Tip: a ziplock plastic container fits perfectly inside for the water. I love this in the fall using foliage from Penstemon Husker Red and Weigela Wine & Roses. It doesn’t take up too much space and looks great on the mantle or on the side of the bar. This is my favorite. Using a simple white vase I can pick anything and everything from the garden to play with and create an informal and colorful display. 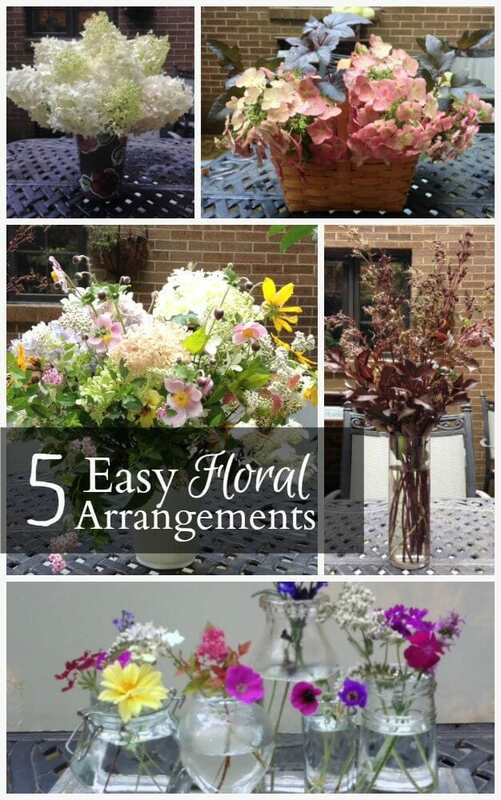 All of these arrangements are simple and allow you to enjoy the beauty of your garden inside your home. Sometimes it’s hard to cut your beautiful blooms but remember, cutting the flowers helps the plant to continue to grow and produce more foliage and blooms. Gorgeous arrangements! I think the last one is my favorite…I’m loving the country (little bit of a lot) in one vase…it’s just beautiful. Thanks Christine. You are too kind! I love the basket with the ziplock container for water idea–never thought of that. All these groupings are beautiful! They really are not hard to do. That’s what I’m trying to convey. My thought was somewhere in the 5 displays people would will find something that inspires them.